From John Sayles, one of the essential, iconoclastic voices of American independent cinema, comes "Silver City," a film that is equal parts scathing political lampoon and sun-stunned neo-noir detective story. 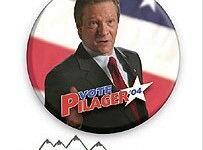 Set against the backdrop of a mythic "New West," "Silver City" follows grammatically-challenged, "user-friendly" candidate Dicky Pilager (Cooper), scapegrace scion of Colorado's venerable Senator Jud Pilager (Murphy), during his gubernatorial campaign. When Pilager finds that he's reeled in a corpse during the taping of an environmental political ad, his ferocious campaign manager, Chuck Raven (Dreyfuss), hires former idealistic journalist turned rumpled private detective Danny O'Brien (Huston) to investigate potential links between the corpse and the Pilager family's enemies. In the tradition of the great films noir, Danny’s investigation pulls him deeper and deeper into a complex web of influence and corruption, involving high stakes lobbyists, media conglomerates, environmental plunderers, and undocumented migrant workers. With pitch-perfect dialogue, unerring sense-of-place, and a slashing satiric strain, "Silver City" offers John Sayles's timely and toxic look at the state of the union on the eve of the 2004 Presidential election.